I've built 3 raised beds to try my hand at growing some veg. Now I need to fill them. Volume of each bed is 0.864 cubic metres, so total of 2.6 cubic m.
I was thinking of using 2 cubic metres of topsoil, 0.2 cub m of garden compost and 0.4 of peat moss. Does this soundd reasonable? Also, should I add some kind of fertiliser to the soil and if so, now or closer to sowing time. Well done, corkgardener, that's a great start. - once filled, I would allow the beds to get a thorough soaking to help settle the soil, then I would cover them with black polythene or similar to reduce leaching, until you are ready to sow/plant. I'm looking forward to progress reports as the year goes by! Best of luck with it. Hopefully I'll be here showing off my results come summer time! Maybe you should have a look at this chaps site. I attended a talk by him last season in Dublin where behind the National Collage of art and Design they have a garden, if your ever in dublin have a look as the gardener there is very enthuastic and friendly. You should increase the quantities that you need to source by maybe 25%. Overfill the beds by approx. 200mm as it will sink and compact. Too late to add more soil once you have planted it. I've sourced horsemanure now to mix with soil. Manure must be well rotted before use. It should no longer smell of dung and should be dark and crumbly. Fresh manure will likely introduce viable weed seeds. It will also rob the soil of nitrogen as it decomposes! You need that nitrogen. So if the manure is still fresh cover it to keep off the rain. Let it mature and use it later on as a mulch. 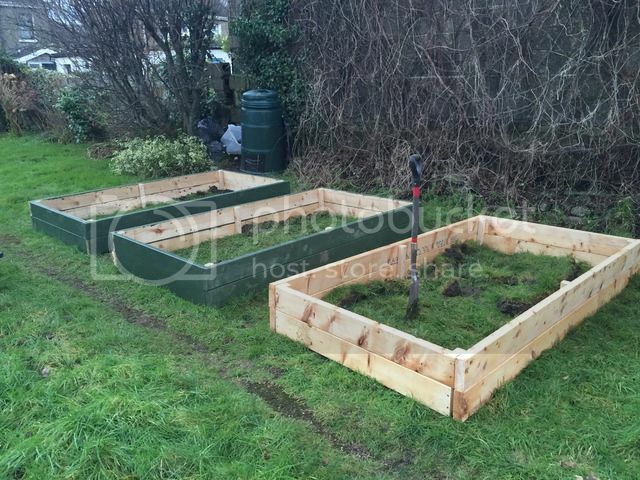 We replaced our old ground-level two beds with three raised beds this year. Considering the late spring and the fact that a lot of stuff was in pots or delayed sowing, we have had a really good year. Much better than the last few years with the old veg plot. GG mentioned raised beds drying out fast. I found with the topsoil I had (from Envirogrind) that although it contains quite a bit of grit and shell, it does retain moisture very well and has, with all the rain we had, settled quite a bit. Leaf mould and compost dug into the top 4in helped a lot. I think you will be amazed at how much you can produce from raised beds. All we need now is the weather! Enjoy, and don't forget the photo's! PS photo taken late afternoon - only time garden is shaded. I now have stone on the paths - dry feet, yay! Plant the lettuce in succession that is sow some every few weeks That way you won't have a glut of them. I wouldn't be without some Broad Beans, or don't you like them? Also if you like salads, a patch of land cress doesn't take up much space and gives lettuce a bit of omph!